It’s time to use TRON at full capacity. By the number of launched smart contracts tokens, Ethereum still leads. But this only means that users do not know or for some reason are afraid to use more convenient options. The blockchain of the TRON network has established itself as a supplier of new entertainment content system and game industry. But I want to note that its capabilities are much wider and more diverse. Ethereum platform can only process 10–25 transactions per second. In contrast, TRON is able to process 2000 transactions per second. 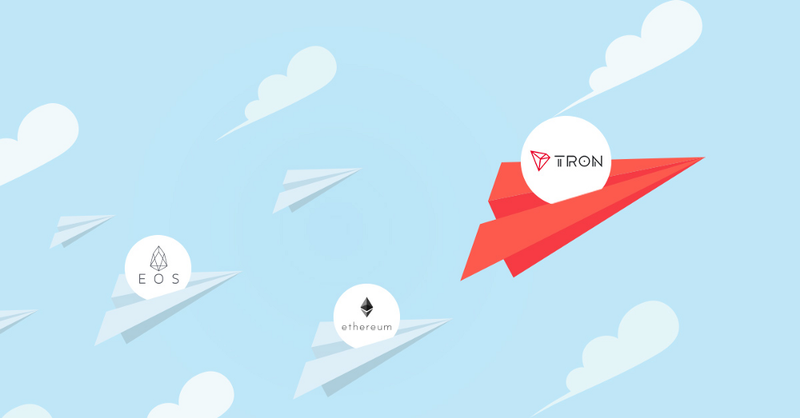 An additional advantage of the TRON is that the transactions of smart contracts on TRON Mainnet are free. This will definitely add motivation to creators to develop DApps on the TRON platform. Why is Ethereum is scored as popular, or rather the expense of which it remains in the first place? The root cause of this is the maximum number of tokens created at the moment there are 1438 implemented projects. There are 270 tokens running on the EOS network. On TRON of all 43 projects, and no matter how many transactions take place in the main network, blockchain popularity is measured by the number of tokens created there. Thus, the situation is such that the number of tokens and projects is insufficient for competition. Recently, Justin Sun himself announced on his personal Twitter account that he would create a fund to save the Ethereum and EOS applications, which would help them migrate to the TRON blockchain. In this regard, you can judge only one thing, TRON is fighting for the number of applications on the network. No need to pay for gas, transactions are free. It will cost you less than the standards. Easy programming of smart contracts, similar to Ethereum. Less competition for listing on the exchanges due to fewer projects in total. TRON is actively growing and is looking for projects that need to be supported. So your chance of patronage from the TRON community increases. TRON holds contests for developers, such as the TRON Accelerator, where you can win financial and marketing support. The TRON creator wants the blockchain to be used not only by game projects but by all other users. MyWish as the winner of TRON accelerator presents the project of simplified creation of smart contracts on TRON opens up opportunities, absolutely for any user without preparation. The MyWish project is leading smart contract platform, where, starting from December 2018, smart contracts for the TRON blockchain without coding are available. Now there is no reason not to launch ICO on TRON. For the start, you will need a Token Contract. You can create it here: https://tron.mywish.io/createpaying 31 300 TRX. See how easy it is to fill out a form. Then, after creating the token, you can proceed to its airdrop, the MyWish team will help you with this. Important to note, that you will need TRONISH token for any contract creation. The MyWish development team is fully involved in the process of building the TRON ecosystem and this will inevitably lead to rapid development. MyWish gives the TRON’s admires the opportunity to develop and believes in the rapid growth in the number of applications on TRON and, accordingly, the users.